"The Curse of Campbell Lake?" My friend Jerry invited me to join the Annual Spring Acid Backpack of July 1980. My life was at loose ends, so I welcomed the new experience. Never having backpacked before, I had no clue what to expect. I hiked in by myself and brought along my aging German Shepard, Baron. I recall sweating uphill in the blazing sun lugging a borrowed aluminum-frame backpack crammed with freshly purchased gear. An orange holofill sleeping bag. A Montgomery-Wards pup tent. A brass Svea stove and jug of white gas. Nesting aluminum pots. And way too much clothing. Counting canned goods and dog food, the backpack must have weighed over seventy pounds. That first trek was up Shackleford Creek to Campbell Lake in the Marble Mountain Wilderness. It changed my life. Those first years, Campbell Lake was the center of my backpacking universe. I returned there several times. My visits were occasionally cursed by misfortune. Once a bear stole my food. One stormy night I was rudely awakened to the shock that my tent fabric was not waterproof. Each time I learned something. Three years later, the ASABP group scheduled a return to Campbell Lake. I hiked in alone a day early through increasing drizzle, splashing across flooding creeks. With numb fingers I set up my tent on the only patch of ground not covered by lingering Spring snow. The rain turned to fat snowflakes that clumped on the tent fly. Damp with perspiration, I crawled into my sleeping bag to get warm, but I couldn't stop shivering. I discovered that by snapping small, dry, dead branches off the standing timber, I could build a campfire. Of necessity I had begun to learn survival skills. No one else showed up. I learned later that, hearing of the harsh conditions and flooding creeks from a ranger along the way, Mr. Popper had posted signs diverting the group to Paradise Lake further north. After that I moved on. Three or four times each summer I backpacked elsewhere. Then on an ASABP to Stoddard Lake in 1986, I met Barbara. Again my life was changed. From then on we backpacked together, Barbara and I, to all the wilderness areas in the State of Jefferson and beyond. Trinities. Russians. Marbles. Siskiyous. Yolla Bollys. Red Buttes. Sky Lakes. Mountain Lakes. Lassen. Caribous. Warners. Eagle Cap. In 1995, Barbara and I decided to backpack up Shackleford Creek. She had never been there. It was the Fourth of July weekend. Never backpack on a national holiday. Campbell Lake crawled with people like an overturned ant's nest. Far from the lake we scraped out a rough campsite for a single night, then continued on to Summit Lake, scrambling over ten-foot-high snow drifts to get there. We spent that night alone in a torrential lightning storm before moving east to Reynolds Cabin and Calf Lake on the southern haunch of Red Mountain. Fast forward another fifteen years. Barbara and I, retired now and on Medicare, tottered on the cusp of our dotage. Only a few backpacks remained unspent. It seemed fitting for me to return to the place where it all started. To close the circle. The hike from the trailhead to Campbell Lake is four-and-a-half miles with an elevation gain of 1400 feet. If the going got tough, we could camp on Shackleford Creek along the way. The forecast was for a slight chance of scattered thundershowers, followed by a week of clear skies. Barbara was willing to give it a try. We spent Sunday night visiting friends at the Trinity Alps Resort. On Monday morning we motored north on Highway 3 over Scott Mountain into the Scott Valley. At Greenview we turned west into the Quartz Valley. Just past Mugginsville we caught Forest Service Road 43N21, which took us to the Shackleford Trailhead (N 41 33' 45.1", W 123 02' 55.7", 4464 feet). The trailhead was obviously a popular place. Pit toilet. Parking for fifty vehicles. Well-maintained corrals for the horsey crowd. Fortunately there were no horse trailers. The lot contained only a half-dozen cars and trucks. Beneath tall firs and within earshot of the rushing creek, we set up camp in the van. There was even a picnic table. No one else was around. The air was muggy, but bugs were few. That evening, lightning blazed and thunder crashed around us. A violent microburst of wind rocked us after dinner, but only a light drizzle fell where we were camped. Somewhere above a storm raged. The Curse of Campbell Lake? On Tuesday morning we awoke to clear blue skies. As we ate our oatmeal, a dusty truck rumbled up the road and dropped off two backpackers, who promptly set out up the trail. Then a couple of dayhikers drove in, parked, and started up the trail while we did our final packing. We were on the trail by eight-thirty. An early start for us. But hiking uphill in the cool of the morning was a tactical necessity. Above the north bank of Shackleford Creek an old logging road had been bulldozed into morainal deposits and outwash. Below, the creek pounded over an inarguable chaos of rounded rocks and boulders. Metavolcanic bedrock. Ultramafic fragments torn from Red Mountain. Granodiorite transported from the faraway Shelly Lake Pluton. The trail crossed Back Meadow Creek, then climbed steeply southwest up the abandoned road through a healthy, mixed-conifer forest. At the road's end, we came to an antique sign, leaning drunkenly against a tree, announcing that we were entering the Marble Mountain Wilderness. A smile curled my lips. I drew a deep breath. I had returned home to a sacred place sculpted by purblind forces of nature. Where man is an irrelevant, transient visitor. The trail climbed southwest through a steep gorge with slopes of sharp metavolcanic bedrock and talus. To our right loomed the forested wall of Red Mountain. We climbed to a weathered wall of dry-stacked stone and passed through a cattle gate. A quarter mile past the gate, in a broad, grassy, sunbathed meadow, we arrived at Long High Creek and easily hopped across it on solid stepping stones. We entered a broad old-growth forest punctuated with a chain of lush, wet meadows. Small streams lined with alders and willows crossed the path. Thirty years had passed, but I remembered these woods. On my very first backpack, alone and apprehensive, I had propped my pack against a fallen log and wandered into the brush to teach myself a fundamental backcountry hygienic skill. In the wilderness all sanitary engineering is local. The trail climbed gently through the forest to a rocky gravel bar beneath the tall canopy. There stood a sign (see Opening Photo). One arrow pointed left, across Shackleford Creek, to Campbell Lake. Another arrow pointed right, up the creek, to Campbell Lake. 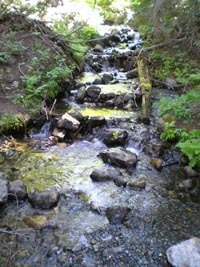 The route across the creek followed the lake's small outflow creek, climbing 800 feet in a little over a mile. Short, steep, and rough, the trail had been abandoned by the Forest Service and was no longer regularly maintained. The right-hand fork was the better trail, if longer. It continued along the northwest bank of Shackleford Creek through a steep side canyon of well-maintained switchbacks. 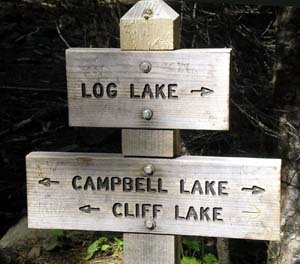 It would also allow us to stop at Log Lake along the way. We took the longer, gentler trail. We climbed through the canyon, twice crossing its perennial creek, where we stopped amid ferns and wildflowers to pump water. We emerged above the gorge to rejoin Shackleford Creek and soon passed the Red Mountain Trail fork to the right. That way lay Reynolds Cabin, Calf Lake, and Long High Lake. Continuing on the main trail, we arrived at Log Lake. Maybe an acre of green water. Lots of lily-pads. No apparent inlet stream. Surrounded by forest and meadow. No headwall. The shoreline was choked with grass and brush. Old weathered logs poked out of the shallow water. Not a bad place. Not a great place. An abandoned campsite beside the trail was little used. The fire ring had been broken apart and the blackened rocks scattered by little rangers. "Too close to the water," they would say. We dropped our packs against a fallen log and ate cashews, crackers, apple chips, and cheese sticks. After lunch, rested and rejuvinated, we considered our options. We had three choices. Continue on up Shackleford Creek to the headwaters at Summit Lake. 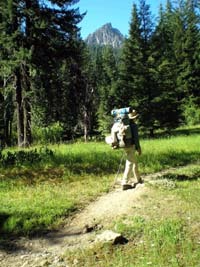 Or cross the meadow and climb another 400 feet in a mile or so to Campbell Lake. Or stop at Log Lake for the night. But it was early afternoon, and Log Lake was not particularly enchanting. Summit Lake seemed to lie in the wrong direction. So we continued on to Campbell, taking the climb slow and easy. Beyond Log Lake a broad glacial valley opened with long views of the surrounding mountains. Across the dry, yellowing grassland of the upper Shackleford Creek Valley the peaks bore witness to the chaotic collision of bedrock. The gnarly red peridotite of Red Mountain dominated the horizon to our right (northwest). It was grinding out a battle with the black metavolcanic greenschist crags and spires that held Cliff Lake to our left (south). Between them, Campbell Lake was cradled in the melange of competing rocks and debris. Through the meadow and glacial till of the valley floor flowed the meandering strands of Shackleford Creek, which we would have to cross. A few isolated thunderheads had begun to blossom in the otherwise blue sky. Soon a trail sign pointed left to Campbell Lake, and we followed the trail through the wide meadow, crossing three separate streambeds of Shackleford Creek. Only one contained flowing water. It was here in 1983 that I had slogged through floodwaters overflowing the banks. Cow pies now befouled the empty channels. A few black cows mooed at us from the shade of distant willows. Then the trail began a steady, numbing climb through forest shade until it crested the rim of the bowl that held Campbell Lake. We dropped to a trail junction at the northeast corner of the lake. Arrows pointed left to Summit Lake and right to Cliff Lake. I vaguely remembered our old campsite on an island at the end of a peninsula that protruded into the lake from the north shore. It had not been easy getting there. My instinct said turn left. As the trail neared the shore, we saw a campsite across the water a few hundred yards to our right. A man and a woman were standing between their tent and a massive rock outcropping that rose abruptly from the water. "Have you seen any other good campsites?" I called out. "There's a real good campsite just on the other side of this boulder," the man replied, jabbing his thumb to the outcropping behind him. "We wouldn't want to crowd you." "No problem. We can't even see it from here." Barbara and I were both tired and aching to take off our packs. Hunting through woods and brush for a remote, thirty-year-old campsite did not sound like fun. So we turned around and retraced our steps past the trail junction. Not wanting to intrude rudely through their campsite, we followed the shoreline trail toward Cliff Lake, figuring we would cut back to the water further up. The trail passed three small tents, then hooked around to the northwest side of the lake. When we finally tried to cross back to the lake, we had gone too far and ended up at a marshy bog. A big, empty horse camp beyond the bog seemed inaccessible without a horse. We split up and wandered lost among a maze of outcroppings and boulders until we found a spur trail back to where the man and woman were camped. We rousted the woman from whatever they were doing in their tent. She seemed neither young nor old. Patiently she pointed us to the promised campsite. We arrived at an excellent campsite with splendid views of the lake and mountains beyond (N 41 32' 02.6", W 123 06' 28.7", 5790 feet). It was perched on a forested outcropping of rusty ultramafic bedrock. Rough boulders along the shore provided privacy and a place to sit and swim. We had been hiking for five hours and were tired, but not exhausted. The hike had been a good one. In our moment of triumph, a black thunderhead moved across the sun. Before we could set up the tent, drizzle began to fall. We pulled out our ponchos, stood under sheltering trees, and waited. The rain grew heavier. Fat drops pummeled straight down without a breath of wind. Thunder rumbled. The lake grew choppy and boiled from the rain. The Curse of Campbell Lake, I thought. Hunkered down in our grove of firs and pines, we didn't even get wet. Like a stray dog, the thunderhead soon lost interest and sallied off to bark at other campers, leaving our neighborhood with clear blue skies. There was only one relatively level tent spot. It was a tight fit and the angle a little steeper than usual, but it would work just fine. I strung up the hammocks and engineered the fire pit to accommodate our grill. An occasional mosquito buzzed past. Sporadic. Anemic. We would encounter more aggressive ones in the deep woods of evening, but on the lake shore they were not a problem. After a refreshing swim, we explored the vicinity. A short path climbed over a hill and dropped to the main trail where we had seen the three tents pitched. Three men were camped there, all on the twilight side of middle age. We spoke with one. He was local, from Chico. He explained that the other two were old friends who had moved back east. One now lived in Atlanta, the other in Raleigh. They had recrossed the country for a backpack and a little auld lange syne. 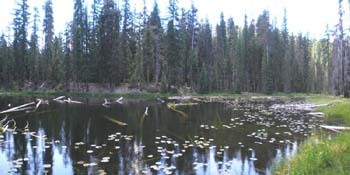 The forest in the lake bowl made cross-country hiking difficult. Slender trunks grew tightly packed together. Not a pigmy forest, but certainly not the open parkland of the towering old growth that thrived in the canyons below. Probably because of the poor ultramafic soils. I did a cursory inventory. Lodgepole pine. Mountain hemlock. White fir. Red fir. Douglas fir. An occasional towering sugar pine. A few groves of aspen. Along the shore and streams, red alder and willow. The usual suspects. That evening I gazed out over the lake looking for the island and peninsula I remembered. Like Sicily off the boot of Italy. And there it was, just across from us. What had appeared to be the east shore of the lake was actually the west shore of the peninsula. But the island was no longer an island. I studied it through the binoculars. The water had dropped a couple of feet, and the stepping stones linking the island with the mainland now studded a narrow isthmus. The island had become a part of the main. Wednesday we spent a leisurely morning at camp gazing out over the lake. Birds flitted through the branches above our hammocks. A flock of chickadees. An olive-sided flycatcher. Steller's jays. Brown creepers crawling up the trunks. A red-breasted nuthatch crawling down. Robins patrolled the meadowlands. High on a barren bough, an osprey kept vigil. After breakfast Barbara agreed to hike back three decades with me to explore the island campsite I remembered. The shoreline trail left the water to cut diagonally across the base of the peninsula's rocky spine. The ridge itself was a collision of glacial deposits and basement rock from the surrounding ultramafic and metavolcanic formations. Near the crest we left the trail to cross-country down the peninsula. The hike through boulders and trees and around fallen logs was rough, rocky, and difficult, but worth the effort. The shore closed in on both sides. The peninsula narrowed. I found myself searching for a particular rock, only vaguely remembered. A shape. A low boulder. An altar that had formed the heart of my old campsite. Although I retained no clear image in my mind, I knew it instantly when we saw it. And I remembered. 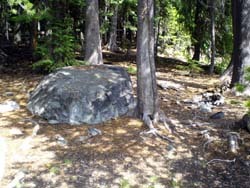 I had camped beside this rock three decades ago. My tent had stood nearby. The others had all crossed the stepping stones to set up their tents around a huge fire pit on the island. I had stayed on this side. Perhaps because I was an outsider. Perhaps so I could preserve my space. Or perhaps, even then, on that first backpack, the silence of the unsullied wilderness had already touched me. I knew I would not be entirely comfortable with boisterous laughter around a blazing bonfire deep into the night. I sat on the familiar slab of metavolcanic rock, its corners rounded by time and water. Its flat top had served as my table. Rocks, stacked against one side, had formed the fire ring. The fire ring had been broken up, the rocks scattered. No clearing for a tent site remained. My first campsite had been erased. Barbara found the stepping stones that crossed to the island. They were now high and dry on a ten-foot-wide isthmus. Signs proclaimed the island to be a restoration site. No camping. No fires. "Responsible Recreation Helps Keep Public Lands Open." I was not disappointed. We stepped onto the island, a boulder-strewn and lightly-forested dome of bedrock. Where a slab of the bedrock angled gently into the water off the north shore, we enjoyed a pleasant swim. Sunning ourselves dry, we ate lunch facing the lake's east shore, not far across a narrow arm of water. At the northeast corner of the lake, a man-made dam held back the waters. From the dam the old, unmaintained trail dropped 800 feet down the outlet creek to rejoin the Shackleford Creek trail. The short, steep route. We had a spectacular view of a ring of snowy pockets in the black cliff face rising above Cliff Lake to the southwest. I wandered around the island and recognized the little grove where our old bonfire had been. And the sites for tents crowded around it. And the high outcropping where young men and women, strangers to me then, had dived naked into the deep cold water. And then I had seen enough. My trip down memory lane was over. But the circle had not closed. Not really. The past will not be resurrected. At best we brush its cheek in passing. Perhaps there are no circles. Only spirals. This revisitation of things past was already itself becoming a new memory. Faded. Fading. The fuzzy approximation of a reality which once burst forth full-blooded. Effervesced. Evaporated. Defying capture or encapsulation. A new memory to be sketched in this wan account. Barbara blazed a shorter, easier route out to the main trail, and we hiked back to camp to refill our water bottles. Then we climbed the trail a short way toward Cliff Lake. A profusion of flowers grew in the wet meadows bordering the stream that flowed down from Cliff Lake. Columbian wind flower. Columbine. Tiger lilies. Yarrow. Indian paintbrush. Pine drops. Shooting stars. Penstemon. Five fingered ferns completed the arrangements, and a few incense cedars added their own distinct color. My towel was missing from my daypack. I remembered leaving it on the island, in a patch of sunlight, draped across a rock to dry. So we hiked back to our camp and then over to the island. I tried to use the GPS to chart an easier route down the peninsula's wasteland. But in the trees, the signal was weak, the readings sporadic. The little arrow pointed us into more tangles and obstructions than eye-balling it would have done. I found my towel where I had left it. Once again it was easier coming out than going in. Though the island lay directly east of our campsite, it took almost an hour to hike there and back. Thursday morning we broke camp around ten to relocate up at Cliff Lake. In days gone by I must have dayhiked there, perhaps more than once, but remembered nothing of it. The trail was good, if steep. We quickly passed the flower-spangled meadow, then entered a different landscape of sharp greenschist outcroppings and canyons down which the creek cascaded and fell. It was a beautiful climb. 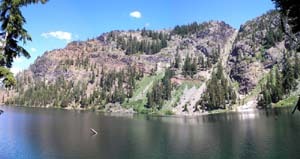 The trail ascended a half mile through dense forest, then descended to the steep northwest shore of Cliff Lake. Impenetrable brush made the water nearly inaccessible. At the north end below us, the outflow stream tumbled from a flat rock, which we would later discover to be the reconstructed spillway of a low dam. We did not tarry there nor explore. 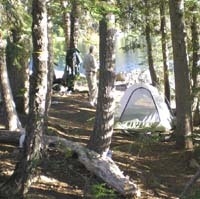 The maps and literature showed the best campsites to be along two inlet streams at the far, southwest corner of the lake. And as usual, we hurried so no one would beat us there. Cliff Lake is the deepest lake in the Marbles. 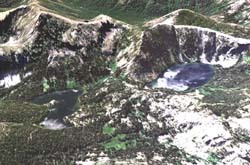 Abrupt metamorphic cliffs, towering more than a thousand feet above the water, plunge steeply into the lake's deep glacial bowl. There is no trail across the massive talus rockfall below the cliffs at the south end of the lake. Fed by melt from snow fields lingering on the north face, the water was cold and clear. We enjoyed the changing perspectives of the wild land. Cliff Lake is the second largest lake in the wilderness, so our hike along the west shore took a while. We came upon three men in hiking shorts and daypacks resting on a fallen log beside the trail. They turned out to be the auld lange syne boys who were camped down the path from us at Campbell Lake. Chico introduced us to the other two. Dayhiking, they had gotten an early start, biding their time. Along the way they had encountered two woman backpackers hiking out of Cliff Lake, who told them the campsite at the far end was vacant. We headed for it. Halfway along the west shore, we crossed a substantial inlet stream on stepping stones. Beyond the crossing a large campsite lay sprawled over the hummocky open forest floor. A major horse camp. It looked a bit worn out and bedraggled. Hooves had dug up the topsoil and manure seasoned the air. The fire pit overflowed with charred wood, rusting cans, and trash. Hoping for something better, we pressed on. As we approached the talus wall blanketing the foot of the impassable south shore cliffs, we arrived at a second large campsite beside a rushing inlet stream (N 41 31' 17.3", W 123 06' 55.5", 6115 feet). The campsite was clean. The stream ran brisk, cold, and melodic. 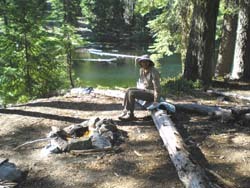 The open forest of red fir, white fir, alder, and hemlock provided level tent sites and a neat fire pit with logs to sit on. The brushy understory was open at the water, like a drape drawn back. We liked it immediately. Our three friends stopped by on their dayhike. As we chatted, they swatted mosquitos on their sweaty bare legs. They said the women had told them about one more campsite "in the rocks" past our inlet stream. Fewer mosquitoes, the women had claimed. When they were gone, we left our packs and fought our way along the eroding tread of a degenerated use trail through branches and brush to a small campsite beside a trickle of water. It lay just below the treeless rockfall that rose all the way to the cliff face above. A patch of snow melted nearby. The place felt harsh and wild. It wasn't bad, but we liked our site better. It felt more hospitable. After dinner, we sat beside the water and watched the changing colors of evening. 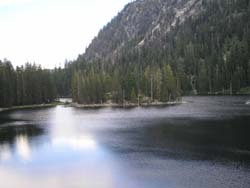 Cliff Lake is one of the most visited in the wilderness. But no one else seemed to be camped there besides us. For the middle of summer, it was a stroke of good fortune and a rare delight. Unfortunately, the mosquitoes grew more aggressive as evening fell. We had endured worse, but they took a bit of cheer out of our enterprise. We dabbed on a little bug juice, but by twilight the only safe harbor was inside the tent. In the cool of early Friday morning the mosquitoes were sluggish. We enjoyed sitting quietly by the lake. Doing nothing. Watching the water. The silent slopes. Wilderness all around us. No other humans to see or hear. Just our tea and mocha and the thousand smells and sounds and nuances that might otherwise be missed. All was well with the world. In late morning we hiked out, without hurry, stopping to explore the north end of lake. Surrounding the dam were campsites we had overlooked on the way in. No one was there. We took pictures of the dam and spillway. Then we moved on. On the narrow trail down to Campbell Lake we passed eight backpackers in a single group. One couple knew a friend of ours in Blue Lake and had just bought a home there. Small world. At Campbell Lake we took off our backpacks at the campsite abandoned by the man and woman who had directed us to ours. We swam and ate lunch. No hurry. Then we stopped by to say goodbye to our three new friends. We took their pictures and they took ours. That morning they had been to the dam on Campbell and saw a large group of backpackers arrive at a campsite on the east shore. They had come in for the weekend. We heard one of them hollering merrily from an inflatable raft in the middle of the lake. Time for us to go. We hiked steadily down, crossed the bovine-infested channels of Shackleford Creek, and stopped at Log Lake. It was three in the afternoon, and we had a hell of a time deciding whether to stop for the night or hike the rest of the way out. The campsites nearby were all right along the trail and not particularly attractive. Leaving my pack, I explored the other side of the lake. One campsite on a bluff overlooking the lily-padded water was a bit more inviting and secluded (N 41 32' 43.5, W 123 05' 58.4", 5541 feet). We decided to stay the night. No surface water flowed into or out of Log Lake. The shallow lake was probably just a low spot in the gravels by Shackleford Creek, fed underground this time of year. Brush and reeds and lily pads at the shoreline made access a problem. We had to improvise a method to collect drinking water. I dropped a rock into our plastic milk jug, tied on a rope, and slung it into the deeper water, then reeled it back in. Like fishing. The forest surrounding the lake was scrawny. Lodgepole pines, I thought. But when I looked for lodgepole pines, I found none. Odd. Probably the soils. Somewhere to the west, beyond the trail, we heard a waterfall spilling down the wall of surrounding cliffs. For a long time Barbara watched a water ouzel fishing from rocks and fallen logs on the edge of the water. It was windy until sunset. Then mosquitos came out. They were not as bad as at Cliff Lake. A mild annoyance. Saturday morning we were awakened by the trumpeting of Gyoto monks. The bellowing turned out to be from cows. The meadow was alive with birds and butterflies. We left Log Lake around a quarter to ten for the long hike out. On our way we met a steady flow of newcomers. A couple heading for Cliff Lake. Two dayhikers bound for Campbell and "all the lakes." Four horseback riders, heading toward Summit Lake, leading an overloaded pack mule and accompanied by an obscene number of dogs. One fellow was dayhiking with his dog to Calf Lake and maybe Dogwood Lake. We would find twenty cars and three horse trailers in the parking lot below. The flood gates had been broken open for the weekend, and we rejoiced to be swimming downstream against the tide.